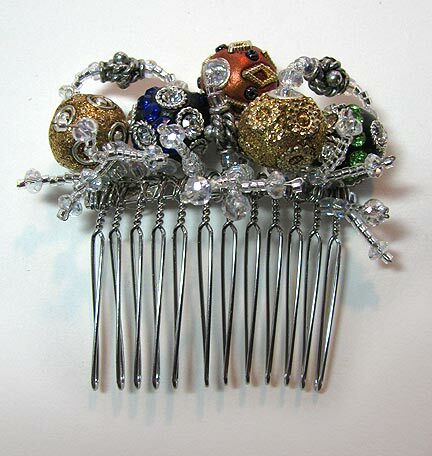 I used 28 gauge silver-toned craft wire so that it would blend well with the silver-toned comb. You'll need a handful of focal beads, some smaller support beads, and some seed beads. I also threw in some crystals for extra sparkle. Hey, it's the holidays! The tools you'll need are wire cutters, chain nosed or needle nosed pliers, and a lot of patience. Be careful when you are pulling the wire through beads and wrapping it around the comb: it can kink easily if you don't work slowly enough. If that happens, secure the wire, clip it off, and start the next part of your comb with an unkinked section. 1. 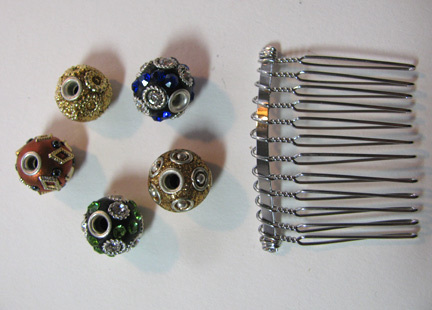 Choose a selection of focal beads for your comb. 2. Wrap a long piece (3-4 ft) of 28 gauge wire around one end of the comb. I started the beading by adding a small branching seed bead and crystal twig, but then I decided to add the rest of them on the second pass. 3. 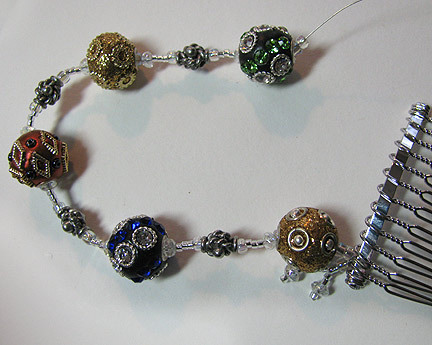 String on the focal and support beads, separated by seed beads and small crystals. 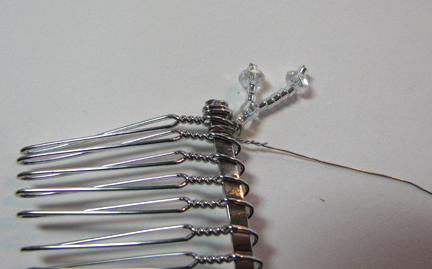 Wrap the wire around the comb, moving towards the other end and wrapping several times in each spot to secure the bead groups. 4. Wrap the wire several times at the far end and then make a return pass, adding small branching twigs as you go. Wrap the wire several times to secure back at the beginning, and clip off close. This would be nice to wear on New Year's Eve too.